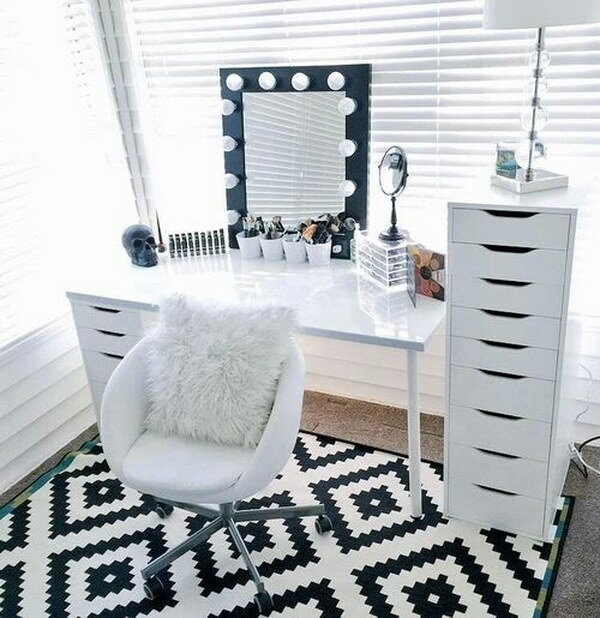 This corner vanity is definitely unique with its U-shaped table, twin mirrors, which are great for hairstyling or seeing your makeup from different angles and extra space. A low, cushioned stool with detailed legs is stationed right at the center. This DIY is all about turning your old, run-of-the-mill mirror into a Hollywood-style vanity mirror, by making your own frame and adding lights around it to create that lighted vanity mirror effect. via nowthatspretty. This oversized, ornate mirror was probably meant more so for people to check their clothes than do their makeup. 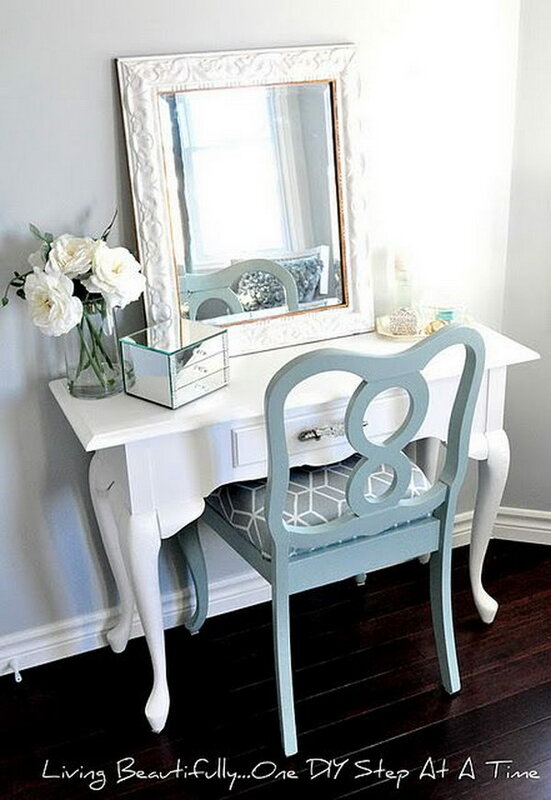 Here, it is half-hidden behind a simple table and chair to complete this vanity setup. 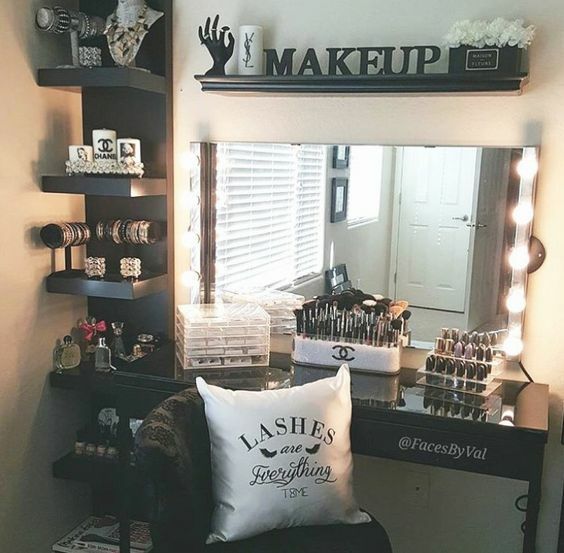 This is clearly a functional vanity area that is all about the activity of putting makeup on, as it is everywhere on the tabletop and you can even see the stored products through it. The table itself is simple white and the chair is clear glass. An embroidered, silver trimmed mirror completes the setup. Via instagram. Aced the blend of farmhouse charm and simple elegance. This vanity is classic and elegant, as all the pieces have clean lines and match each other perfectly to create a seamless look for this white vanity. 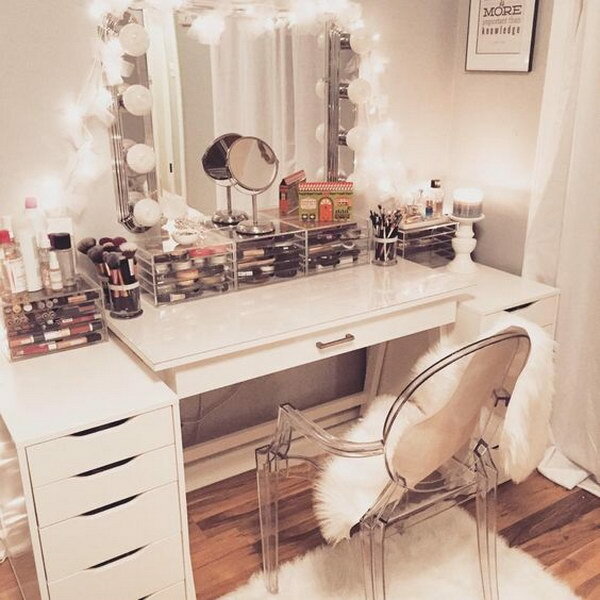 The placement of the vanity itself is also fantastic, as it allows the owner to use all the natural light from the French windows while doing their makeup. source. 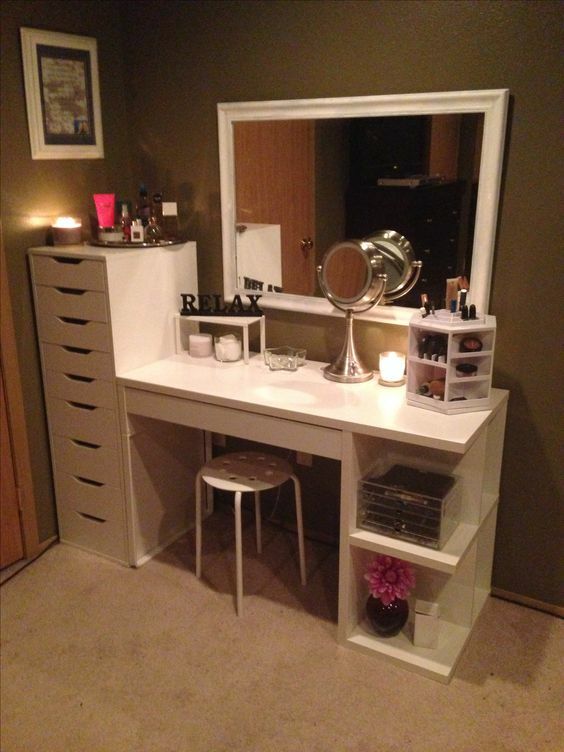 This vanity area is clearly a DIY project. 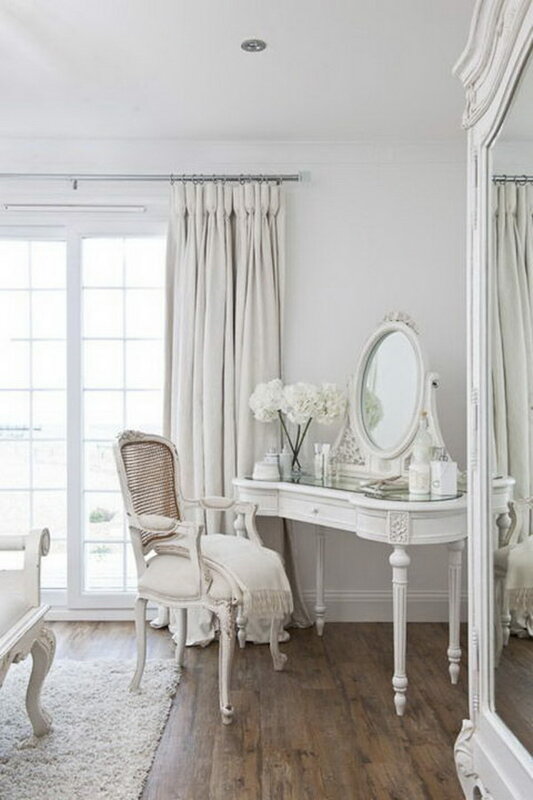 The white, detailed chair is really beautiful, as is the simple table mirror. The embroidered bright coral table lamp adds a fun pop of color and decoration, as does the DIY quote panel in the background wall. This vintage-style vanity is another one that looks like it was pieced together. 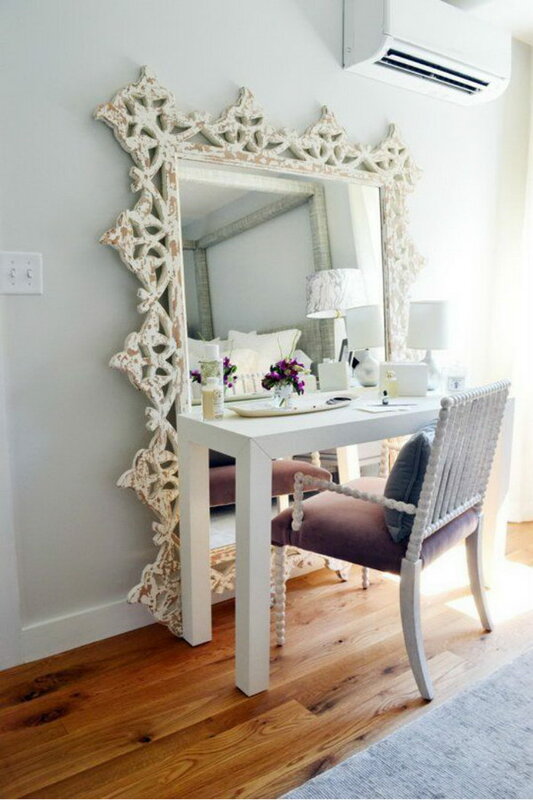 However, the big, white detailed mirror actually works quite well with the dark wood table and the comfortable chair. 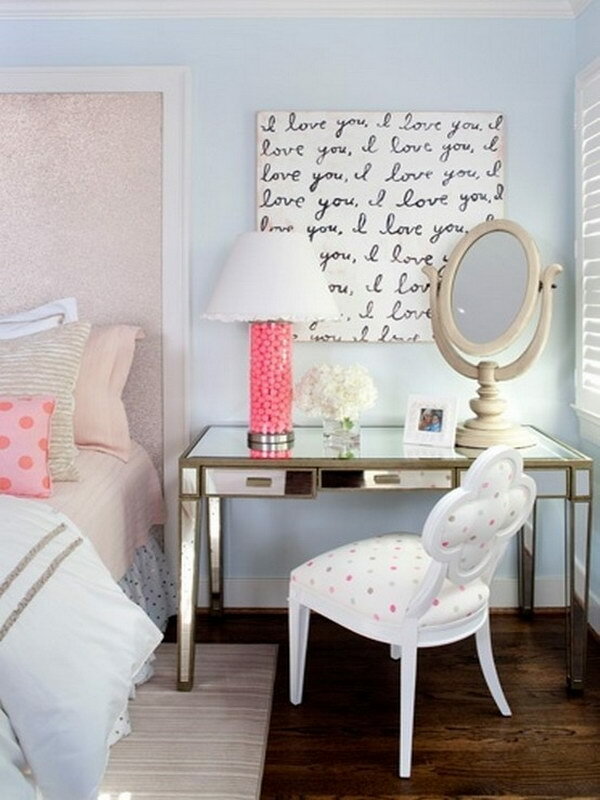 A second, simpler mirror is on the adjacent wall provides more decoration and additional angles for hairstyles. 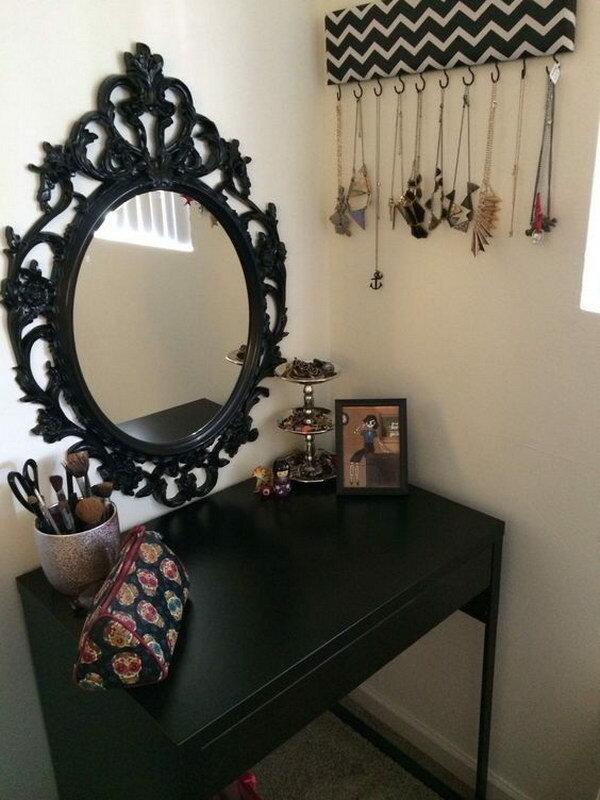 Many pieces in this makeup vanity can be found at IKEA (organizer, vanity, shelving). 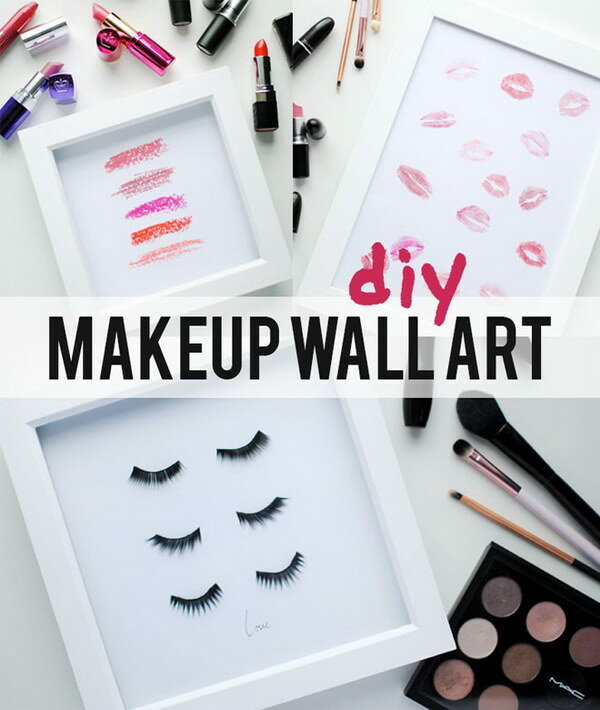 What’s the best way to have all of your makeup accessible while putting it on at your vanity? 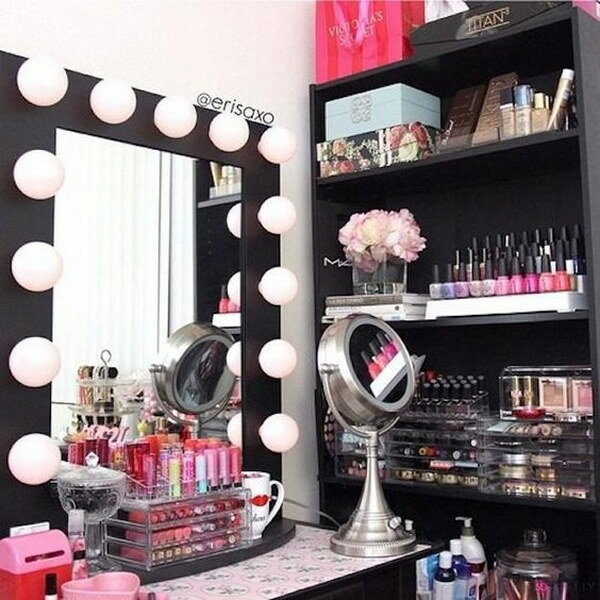 To store it all in a bookshelf –style cabinet that matches your vanity such as this one. This simple white and periwinkle vanity area is really beautiful and fresh with its clean pieces and softly contrasting colors. The table and chair are DIY makeover projects, but they are so perfect in this setting that no one would have guessed it. via livingbeautifullydiy. 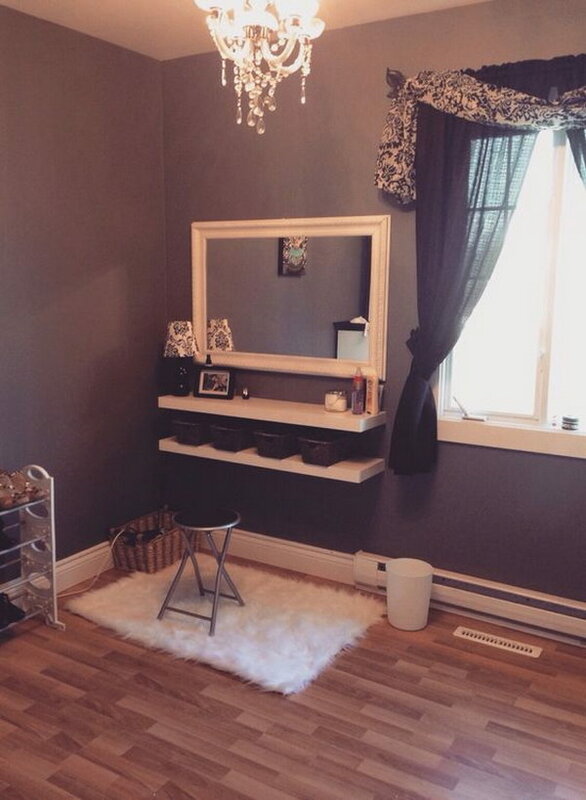 Vanities don’t really go in small rooms, but this project proves you can still have a makeup area. 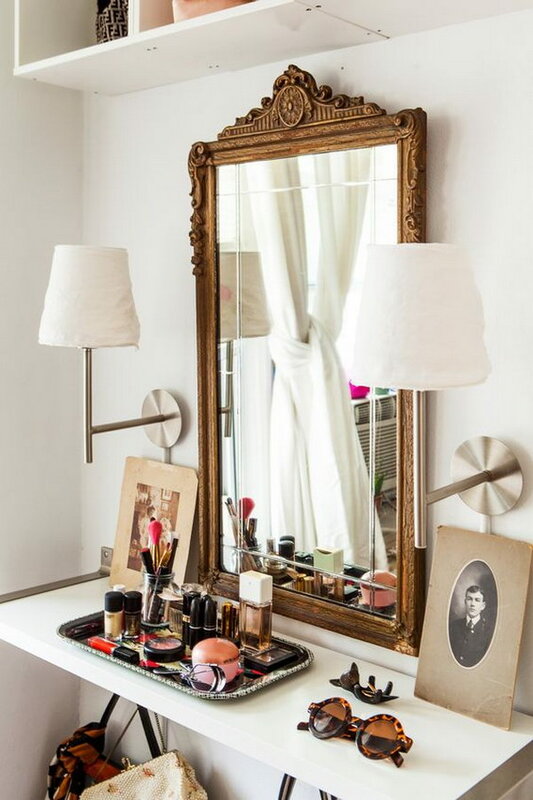 A floating shelf, a lighted wall mirror and an easily movable stool are a perfect, space-saving solution in this case. 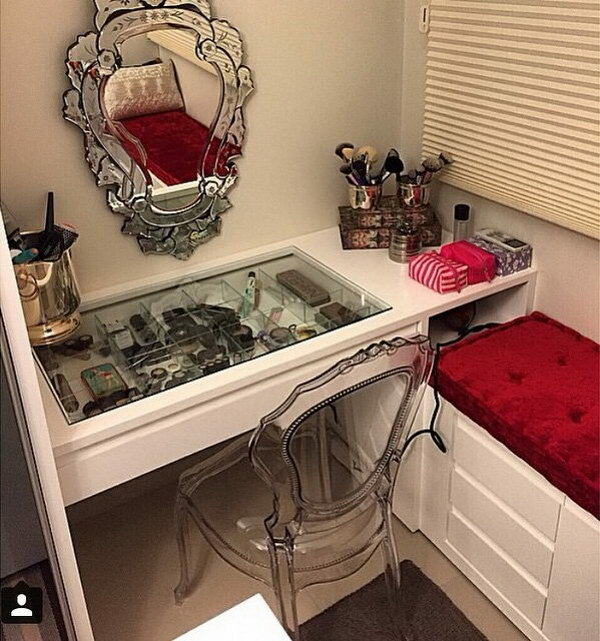 This makeup vanity is pure, well conserved vintage luxury. The beautiful, natural color and detailed design of the set make it truly beautiful, and the placement in front of the windows allows for natural light to be used. The chair isn’t part of the set, but it works quite nicely here. Via cocokelley. 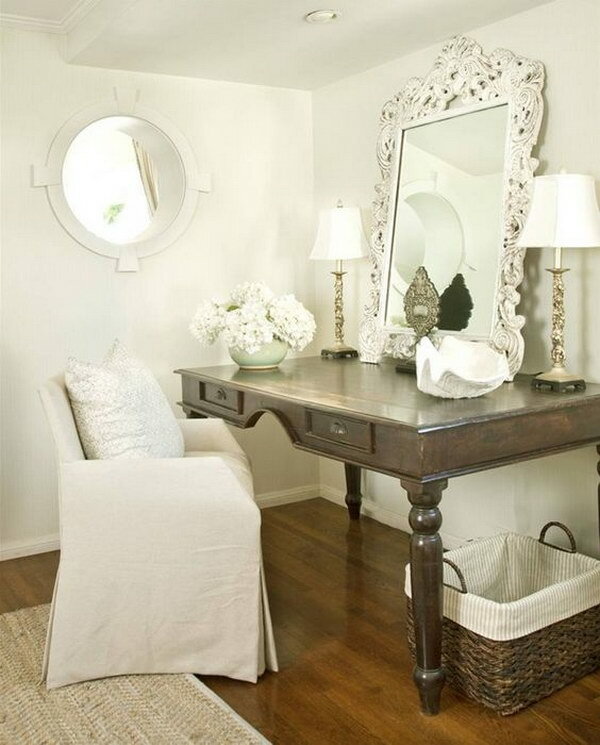 Create a small space vanity with two floating shelves, four baskets, and yard sale mirror painted white. This mirrored table is quite unique in style and proportion. 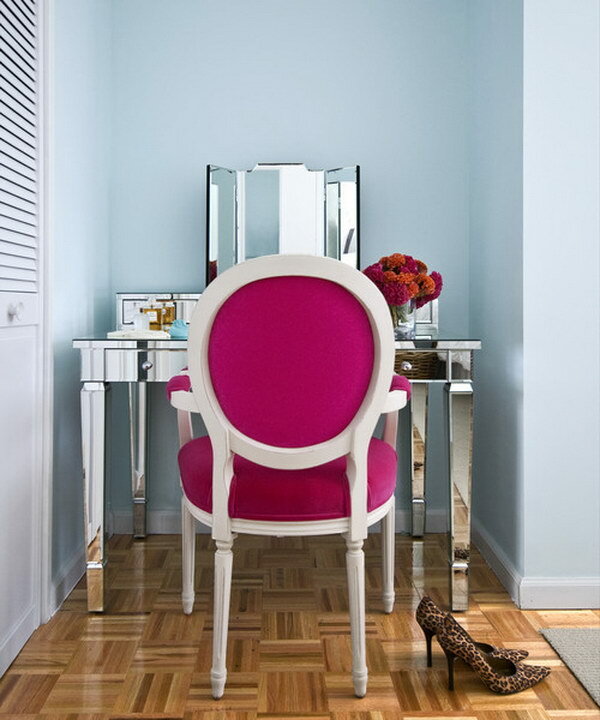 An actual, small mirror is placed on the blue wall behind it and a cushioned, white and red chair, which matches the decorative flowers, completes the setting. via houzz. 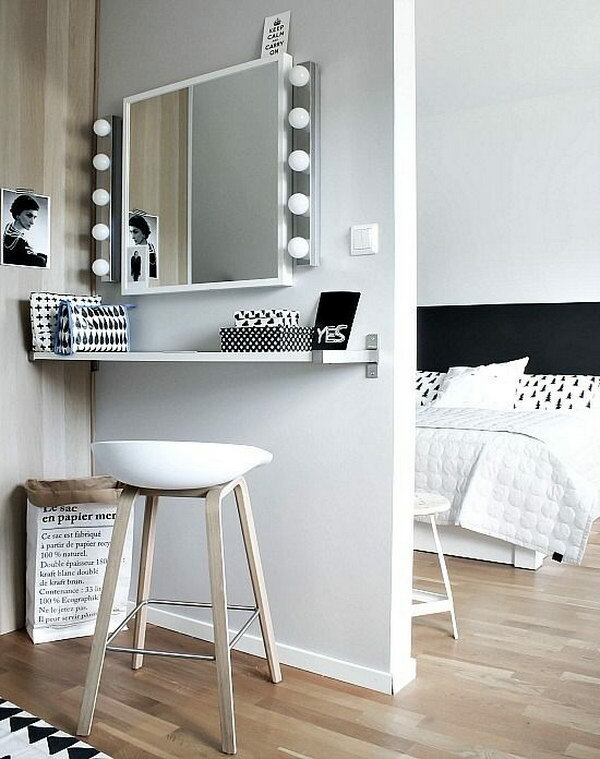 This vanity is pure, simple black and white elegance. The table and two storage towers are simple white, as is the comfortable table chair. The framed black mirror lined with lights completes the look and ties in the patterned floor. source. 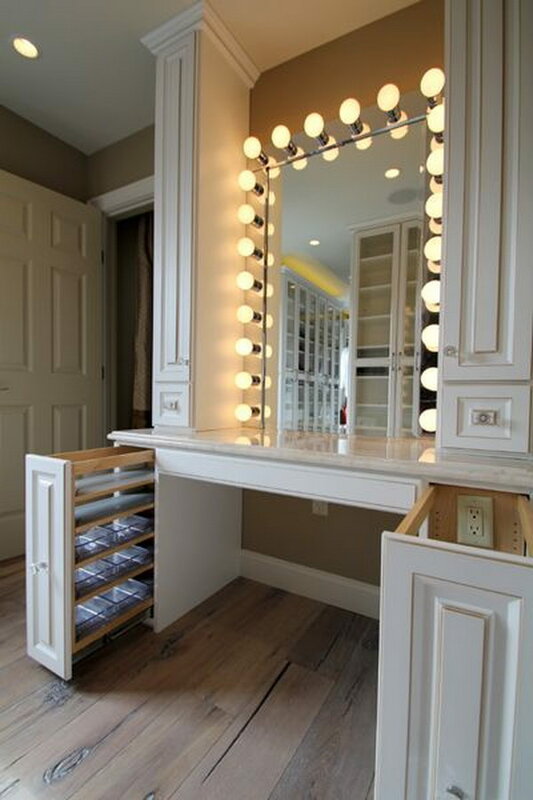 This cream colored vanity area clearly takes inspiration from Broadway and movies. The table itself is quite simple, with a long, shallow drawer on the bottom and several containers lining the back edge on top. 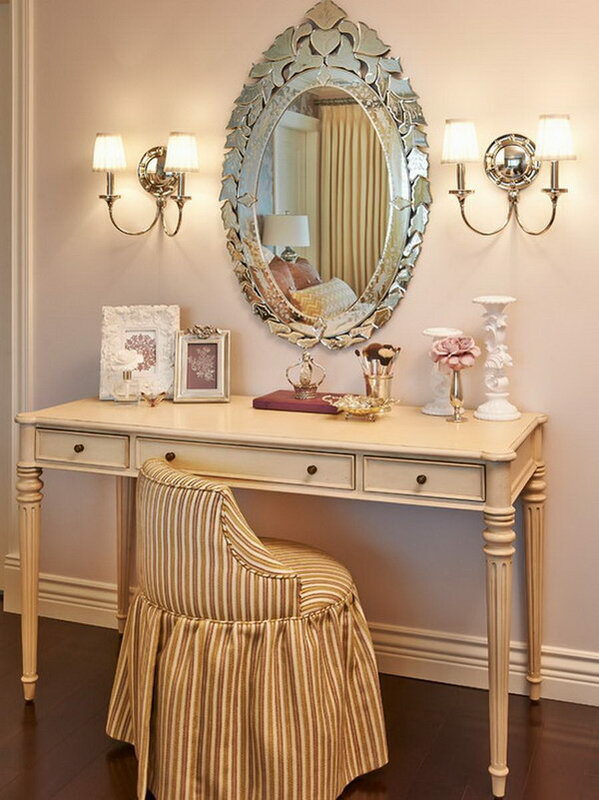 A simple mirror with lights around it, a storage tower on the side and a clear hard chair complete the vanity area. 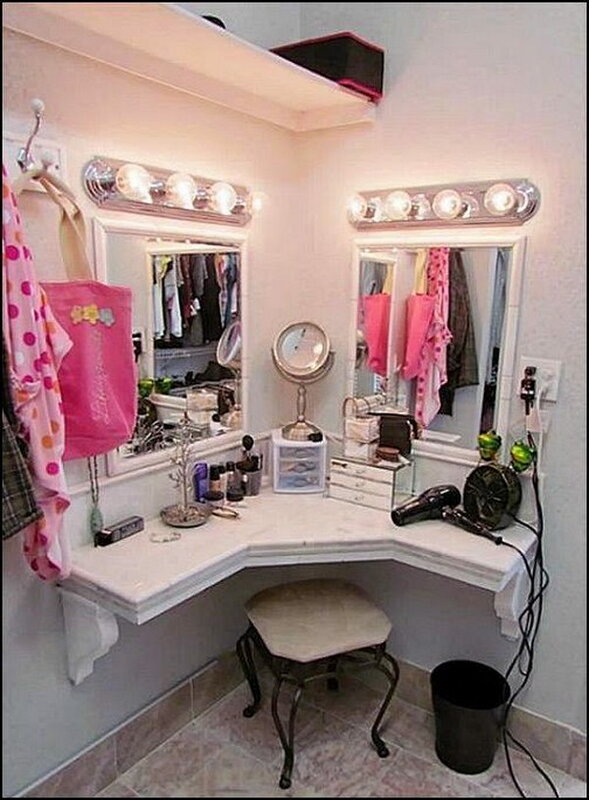 This vanity area has a true Hollywood dressing room vibe with its lighted wall mirror and simple, white table underneath. A natural wood storage area is off to the side and the surrounding white structure and furniture complete the look. Via closetcity. This neutral colored vanity area was designed in truly vintage style. The table itself is quite simple, but the ornate oval mirror and matching frames, along with the wall lights and the fabric-covered low chair give it that real vintage touch. Via kabarpesat. This is another simple yet detailed and well done setup. The big, ornate gold mirror is the main focus of interest, as it contrasts against the white walls and floating shelf/table top. The wall lights are simple enough to be functional yet softly decorative as well. source. 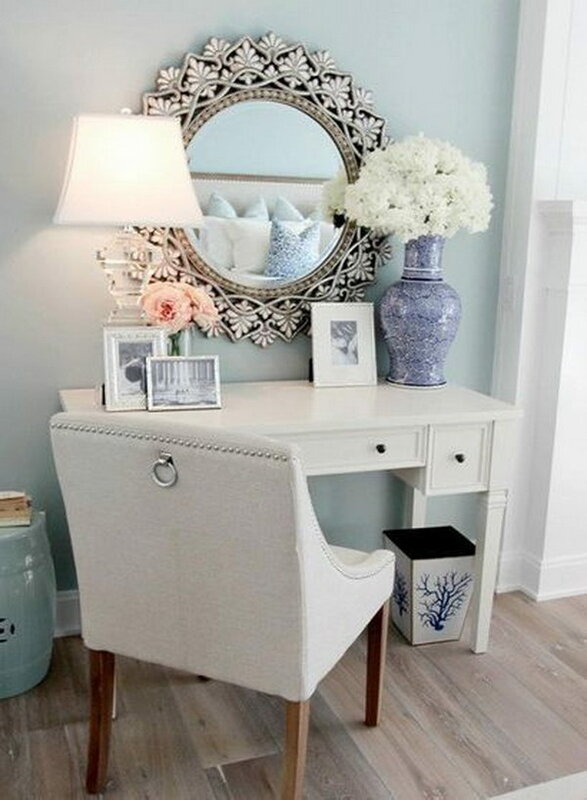 This is a great example of how beautifully a desk can work as a vanity table. 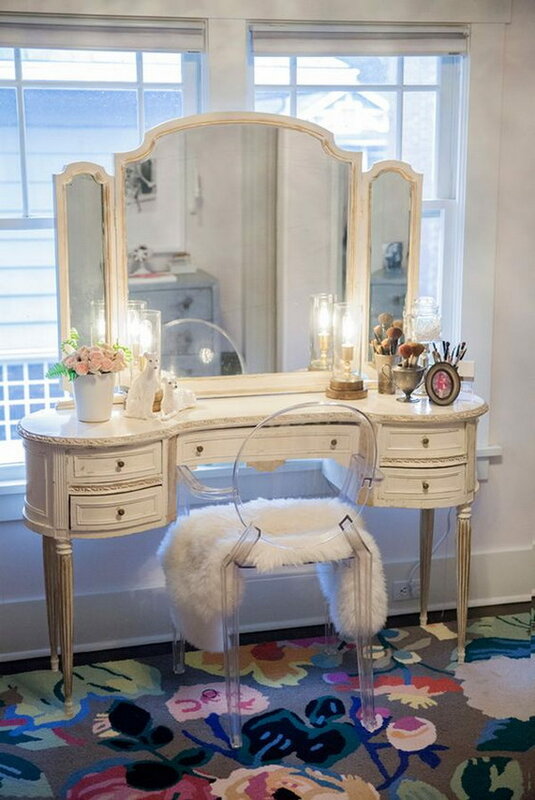 This white one has all the space and storage a girl can need, and it matches the small, framed mirror on the wall and the simple, low stool perfectly. This is so beautiful with the Ikea Malm dressing table, Alex 9 drawer, Alex shelf, Lack table (stool), Bekvam spice racks and custom art. 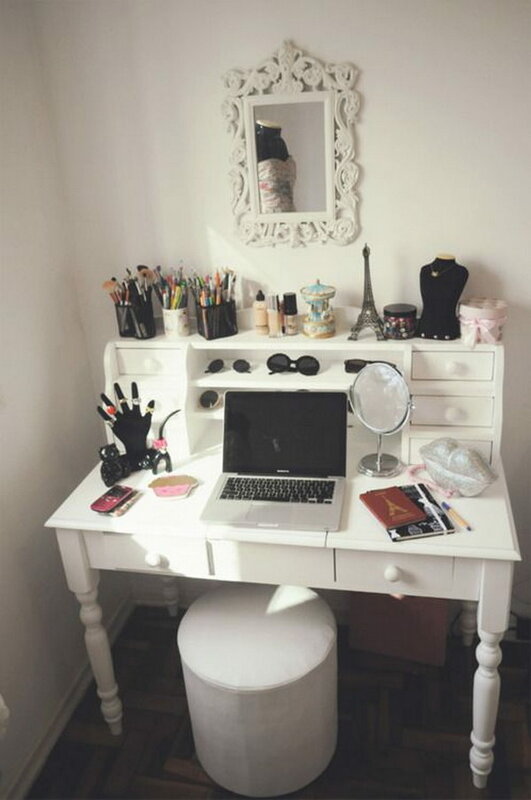 This little white corner almost looks more like a beauty closet than vanity area. 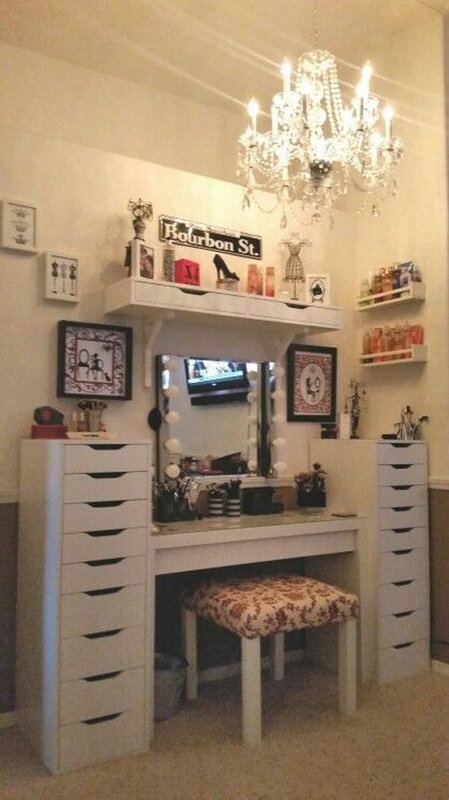 The small, classic vanity table is sandwiched between two tall, matching storage units, which make this setup look reminiscent of a dollhouse but don’t overwhelm the space too much.